Ever had a crappy commute? Of course you have. Do yourself a favor and don’t count all the hours spent crammed into your car with nothing but bad, distracted drivers, depressing radio news reports and your own thoughts to keep you company. Trust me, it’s a downer. Sometimes it’s hard to tell what’s worse — the debilitating aches and cramps or the bad attitude and extreme agitation (FYI — your family would probably vote for the latter). 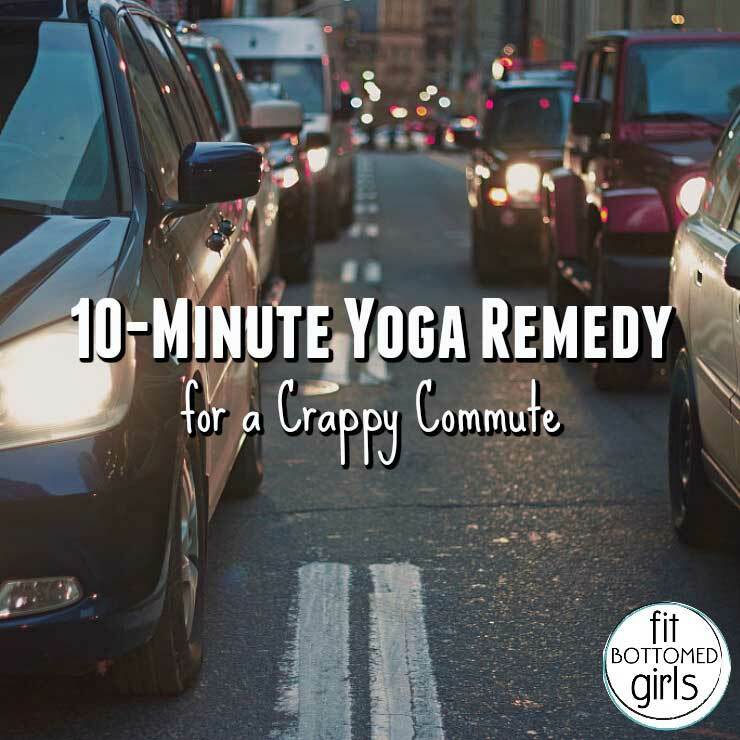 But, lucky you, there’s no need for you to decide which is worse because here’s a 10-minute remedy for both the physical and emotional havoc caused by those nightmare commutes. 1. Legs-Up-A-Wall. Sit sideways against a wall with your right hip touching the wall. Lean back onto your forearms, place one leg at a time up the wall as you turn your torso to face the wall and lie back. Begin gradually extending your inhale to a count of 3 and your exhale to a count of 6. Stay here for 3 minutes. 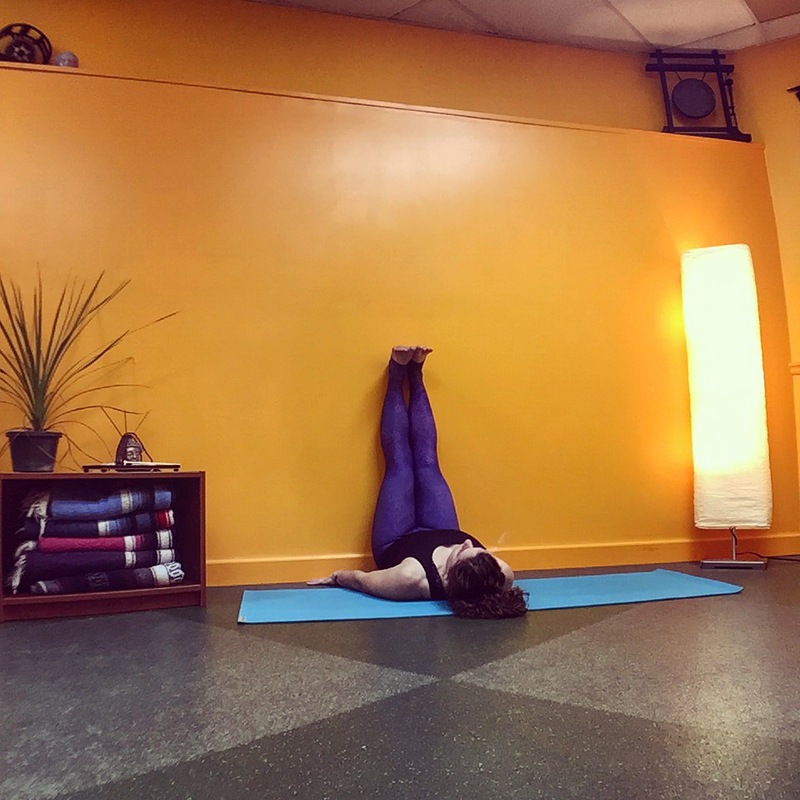 Then, place the soles of your feet on the wall with your knees bent, hug your knees into your chest and roll to your right side to press up to sitting. Helps tame the road rage while stretching the back of your legs and relieving tension in your neck, back and legs. 2. Reverse Plank Lifts. Sit with your legs extended in front of you. Place your hands on the floor with your wrists directly under your shoulders, fingers pointing toward your feet, and lean back slightly. 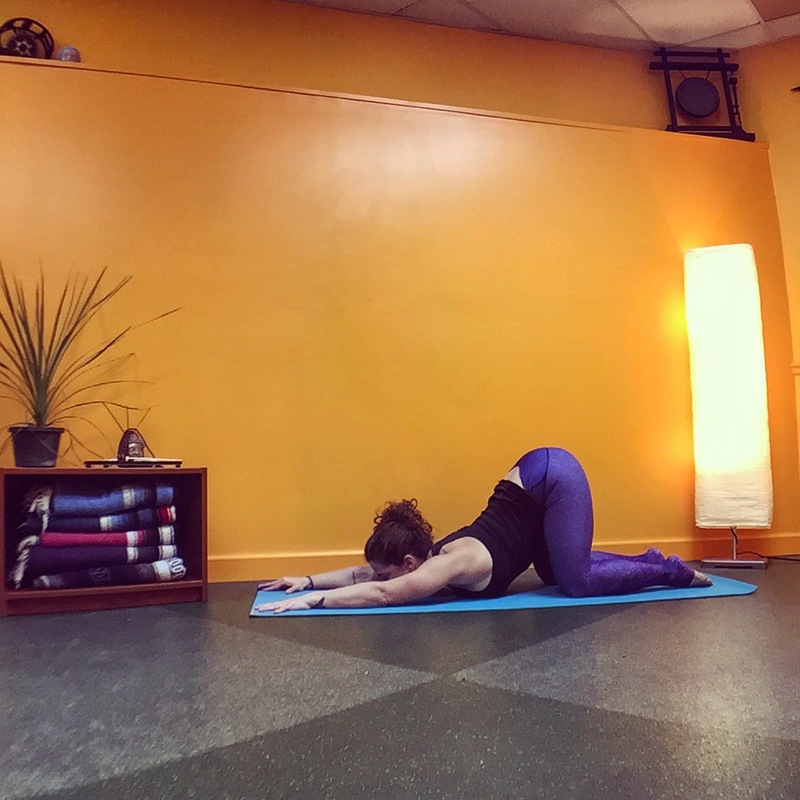 On your inhale, press into your hands and feet to lift your hips off the ground, while keeping your legs straight. If it feels okay to you, you can allow your head to drop back at the top of the Reverse Plank. Continue to move with your breath for 1 minute. Helps calm your nerves and combat the effects of bad posture and fatigue while stretching and relieving tension in your neck, chest and shoulders. 3. Twisted Down Dog. Start in Downward Facing Dog, fingers spread wide, feet planted hip-width distance apart, as you actively press your hips up and back and squeeze your triceps in toward your cheeks. Load all your weight into your legs and right arm as you lift your left hand and grab your right ankle. Work to open your chest and twist it under your right armpit. 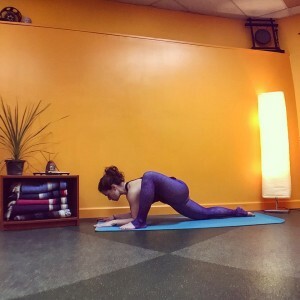 Hold this twist on your right side for 1 minute before unwinding and switching to your left side for another minute. Soothes stress while stretching your hamstrings, shoulders, chest and spine and providing much-needed relief for your back. 4. Extended Puppy Pose. From all fours, have your hips over your knees and your wrists a few inches in front of your shoulders. 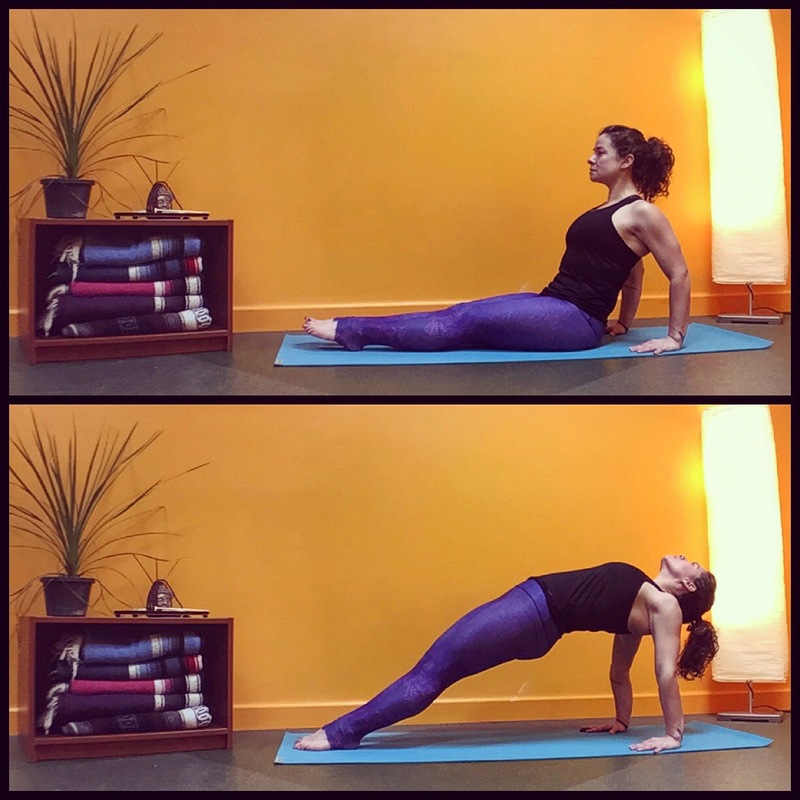 Press your hips back and lower your chest toward the floor while maintaining a slight curve in your low back. Place your forehead or chin on the floor and release your neck. Activate your arms so that your elbows stay lifted and reach out as you press your hips toward your heels. Hold for 1 minute before pressing back to Child’s Pose. 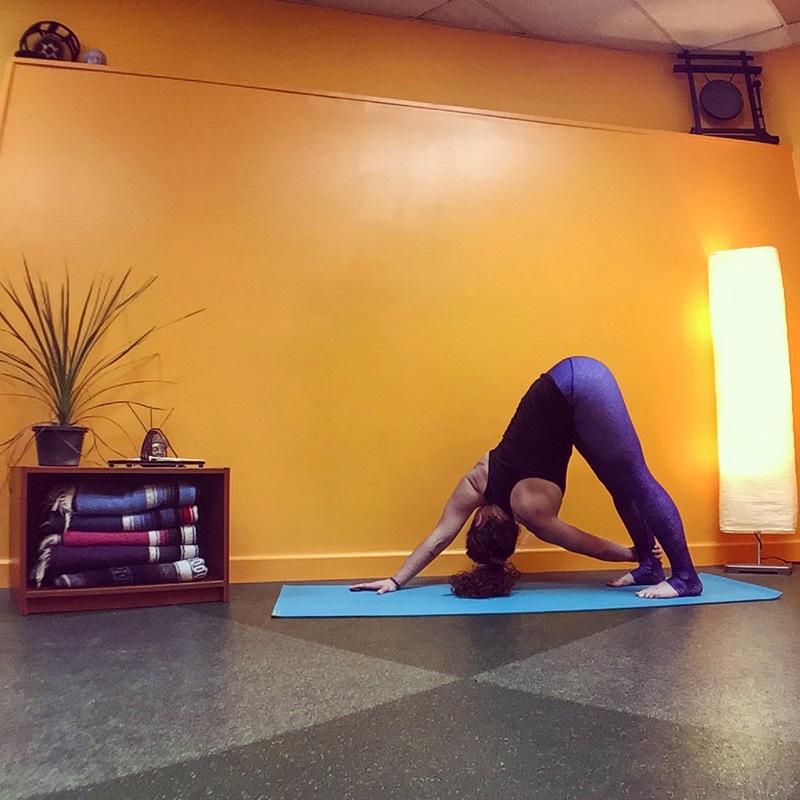 Brings your anxiety level down a few notches while stretching and releasing tension in your shoulders, upper back, arms and spine. 5. Lizard Pose. From all fours, step your right foot forward to outside of your right hand (pinky side). Drop your left knee down, untuck your toes and lower your hips down, right knee behind right ankle. Stay on your hands or lower onto your forearms and keep your chest open. Hold your right side for 1 minute before stepping your right foot back and switching to your left side for another minute. 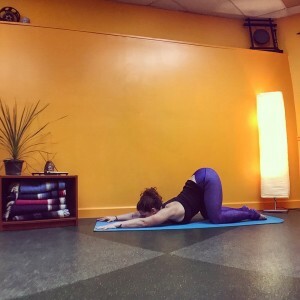 Restores a feeling of free-flowing energy to your body while stretching your hips and thighs and releasing tension in your low back. 6. Supported Bridge. Lie on your back, knees bent with your feet flat on the floor close to your hips and hips-width distance apart. Press into your heels to lift your hips. Place a yoga block, at the medium setting, against your sacrum (the bony place at the back of your pelvis/low back). 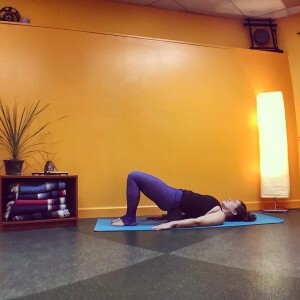 Hold for 1 minute before lifting your hips to remove the block and resting for a few moments in Savasana. Provides a fabulously comforting feeling of support while stretching those hip flexors and relieving low back pain and stiffness. Amazing! I get so stressed out in traffic etc! My boyfriend will be thanking you for this. He can’t seem to understand (since he doesn’t make the commute) why I am still fuming by the time I walk in the door and hours later. Usually I just try to distract myself with more things that make me mad which I know… counter productive. So thank you. I hope this helps!